You know who's pretty good at slinging a car around? Alex Fiorio. The dude spent the years between '86 and '95 racking up WRC wins. 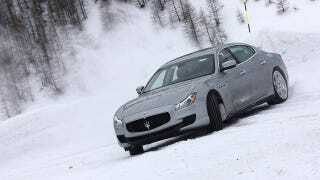 Our man Max Prince recently got to ride shotgun for a couple of laps with the legend in the 2014 Maserati Quattroporte S Q4. On ice. Here's what he learned.